Welcome to the Ccb Bruskos Hotel in Argirathes. Run by a family since its inception and having a cosy ambience to it, the hotel is 450 meters from the sandy beach. The nearest town to the hotel is Corfu Town (30 km). For round the clock convenience of guests, the hotel has a reception, lobby and lounge. The hotel staff is fluent in English and German besides speaking Greek. Children can let off steam on a playground dedicated for them. Guests can look forward to a refreshing dip at the outdoor pool at the hotel after a day of fun and travel. Free umbrellas and sun loungers are provided for guests on the beach. Close to the hotel there are bars, restaurants, the city center, a disco, a bus stop and supermarkets. 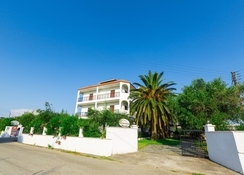 Ccb Bruskos Hotel is located at a very quiet location at the southern end of the village. On foot it is about 10 minutes to the sandy beach. There are two supermarkets on the main street of the resort and many restaurants to try. You can rent quads or scooters in town. Accessible from the hotel: horseback riding (1 km), CFU Airport (29 km) and Old Corfu Town (30 km). 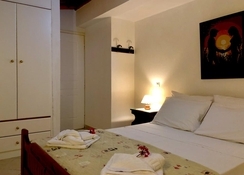 Ccb Bruskos Hotel offers a total of 33 rooms for its guests. Guests can choose from Deluxe junior suites, one bed apartments, standard rooms and deluxe apartments. Each room has a terrace with garden views and a balcony. The rooms have a private bathroom with a shower. Some rooms at Ccb Bruskos Hotel have a seating area. The air-conditioned rooms have a wardrobe and all other amenities which a modern hotel provides. There is an on-site restaurant and a coffee shop / café. You can enjoy a drink in one of the bars, which include a pool bar and a bar / lounge. 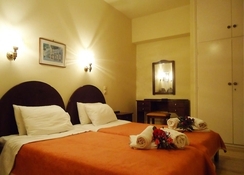 The hotel is close to a number of restaurants and bars in Corfu. The hotel staff make their own wines and is a must try while you stay at the hotel. 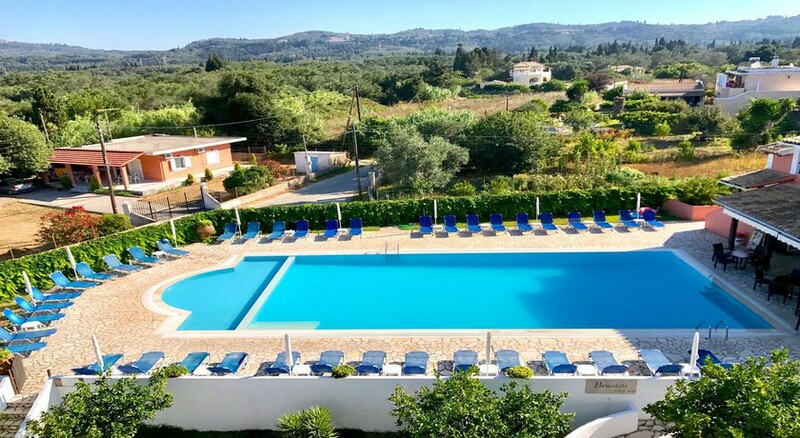 Ccb Bruskos Hotel offers a stunning outdoor pool, the largest one in Agios Georgios. The swimming pool is surrounded by sun loungers and is adjacent to the pool bar. The beach facilitates a host of activities like scuba diving, surfing, paddle boarding and snorkelling. The spa and beauty centre at the hotel offers massages and beauty treatments. This hotel is small and friendly. The pool is lovely and always cleaned daily. The owner’s son brought a bottle of water and two beers to our room when we arrived late at night having been delayed three hours. The rooms are clean but basic. Our room had a fridge and a nicely sized balcony. Howeber the bed was very hard and the air con was temperamental (we also had to pay 5 euros a night for it). It’s a fair walk to the strip (about 10 mins) and there’s a shop about 5 mins away. Overall we had a lovely stay. This hotel doesn’t claim to be anything it’s not and in our opinion, is excellent value for money. We loved our stay here. 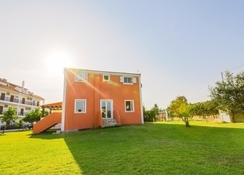 The location was perfect, just off the main road and literally 2/3 minutes walk from the sea in a fairly quiet part of Corfu. It is a small family run set of Appartments which was so relaxed and friendly. The pool side was so calm and at the pool side bar, Irene made gorgeous salads etc for lunches. There were plenty of local restaurants to choose from for evening meals. It was very a completely relaxing holiday in a lovely location.